6-point decline from October to March among those who say Obama is most responsible for state of U.S. health care system. Declining trend contrasts with steady number of respondents who picked Trump. Experts say voters tend to hold current presidents accountable for current state of issues, good or bad. The percentage of voters who hold former President Barack Obama responsible for the current state of the Affordable Care Act and the nation’s health care system has declined in recent months, in what experts said was a possible sign that voters could eventually shift accountability to President Donald Trump. In Morning Consult/Politico surveys conducted Oct. 19-23 and March 8-12, registered voters were asked whether Obama or Trump is most responsible for the current state of the U.S. health care system and the ACA. The majority of respondents in both polls chose Obama, and the percentage of respondents who picked Trump held steady, but one expert said the March poll’s falling trend may signal an eventual change in voter opinion that could have an impact on the midterm elections, which Democrats hope to turn into a referendum on Republicans’ failed push last year to repeal and replace the ACA, also known as Obamacare. “The further we get away from the Obama presidency and the further we get into the Trump presidency, it makes sense that some of the perception of who is responsible for what would shift,” Chris Sloan, a director at consulting firm Avalere Health, said in a March 13 phone interview. “It’s sort of an open question how much voters care about health care in the context of the 2018 midterm elections,” he said, but he also noted that health care was one of the top issues in the Virginia elections last fall, when Democrats made big gains. Karlyn Bowman, a public opinion expert at the American Enterprise Institute, said that as a presidency progresses, “the incumbent is seen as more responsible for the current state of things, bad or good,” pointing to a February poll by Quinnipiac University that showed that, for the first time in a year, voters held Trump more responsible for the economy than they did Obama. With the ACA, “voters are beginning to shift responsibility, even though it was Obama’s signature initiative,” she said. Half of the respondents in the October poll held Obama most responsible for the state of the health care system, which surveyed 1,988 registered voters, but that percentage dropped to 44 percent in the March survey, which had 1,997 respondents. The percentage of voters who hold Trump most responsible for the health care system remained at 28 percent in both surveys. Both polls have a margin of error of 2 percentage points. There was also a decline in the percentage of voters who say Obama is most responsible for the state of the ACA, from 67 percent in October to 63 percent in March. The percentage of voters who chose Trump fell 1 percentage point, from 20 percent in October to 19 percent in March. Many Democrats also see the midterms as an opportunity to boost momentum for progressives’ long-sought goal of adopting a single-payer health care system in the United States. 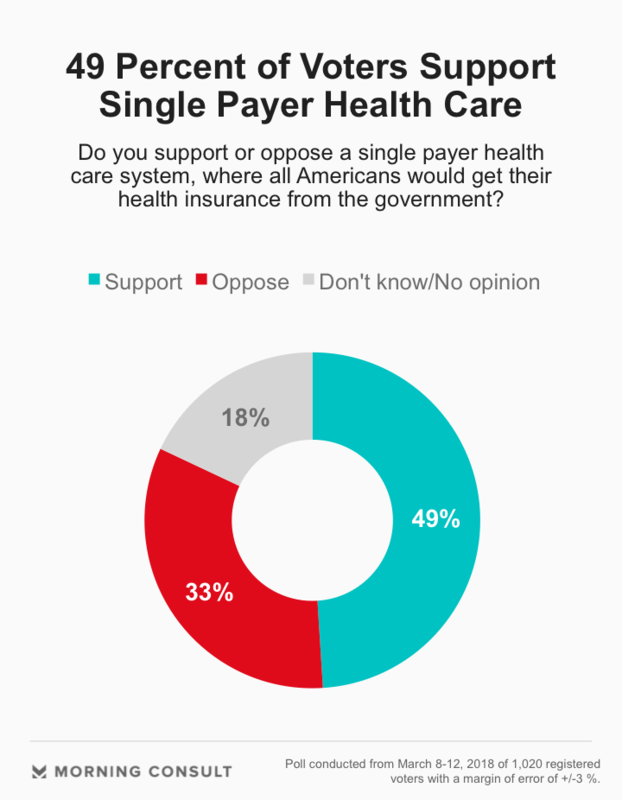 Among 1,020 registered voters in a March poll subsample, a 49 percent plurality said they would support the idea of single-payer health care, in which all Americans would get their health insurance from the government, while 33 percent said they oppose it and 18 percent didn’t know or had no opinion. The margin of error in the subsample is 3 percentage points. On March 7, Ellison became the lead sponsor of a single-payer health care bill that is supported by a majority of House Democrats. The bill was introduced in January 2017 by then-Rep. John Conyers (D-Mich.), who resigned last year amid allegations of sexual misconduct. But while the idea of health care for all is appealing, some parts of a single-payer health care system that voters were not asked about could prove more unpopular, such as tax increases to pay for expanded coverage, Sloan said. “I think if you were to drill down a little bit more into details of policies, I think the support would actually decline,” he said. Critics of single-payer health care point to studies, such as a May 2016 report by the Urban Institute, that show that establishing and maintaining such a system would be expensive. Opponents of single-payer also note that the United States already spends more on health care per person than any other wealthy country. However, 50 percent of voters said in the Morning Consult poll in March that the nation spends too little on health care, compared with 19 percent who said too much is being spent. Eleven percent said the country spends about the right amount, and 21 percent said they do not know or have no opinion. The White House did not respond to a request for comment, nor did a spokesman for Obama. Correction: The subheadline in a previous version of this story misstated how many respondents chose Obama over Trump when it comes to responsibility for the state of health care and the ACA.